Impulse e.max adds additional options for shade selection and clinical applications. There are three Value blocks and two Opal blocks. 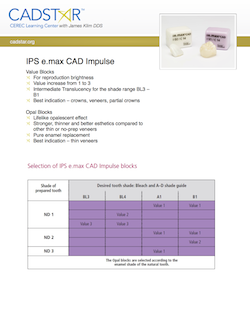 The Value blocks are recommended for crowns, veneers, and partial crowns (value increases from V1 to V3). The block match is determined by brightness. The Opal blocks are indicated for thin veneers. Download the PDF to view firing cycle (which is different than the HT and LT e.max). The Value Impulse selection table will assist in value of block selection relative to preparation color. 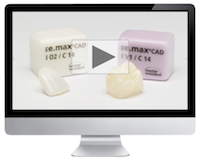 The video, Custom CEREC Color Tabs (CEREC Liftoff Chapter 5), will be useful in understanding how to use the IPS Natural Die material and making a custom shade tab.